Just imagine there was a law machine that could swallow ordinary people’s ideas and transform them into legislative proposals written in official legal language – or turn them into poetic verse. Well, such a machine does exist, and from January 11 2018, you can visit it at the exhibition Law Shifters at Nikolaj Kunsthal. This is how it works: first you write a law in everyday language and on an ordinary piece of paper. It could, e.g., be a law on gender equality, climate, education, the right to privacy or to free speech. 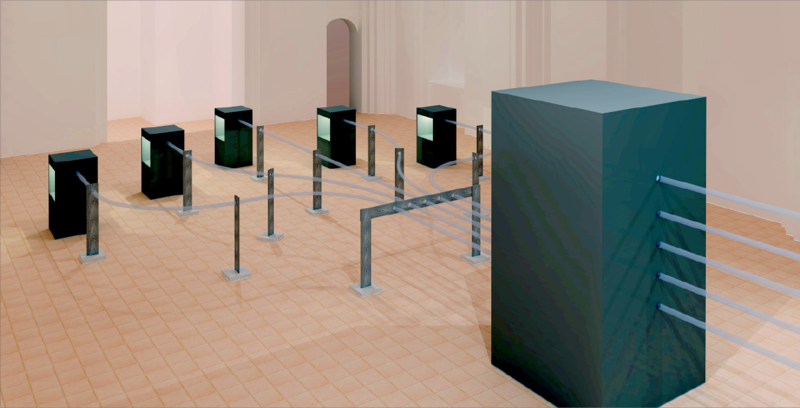 Next you put the proposal into the law machine – a large sculptural construction with a system of pneumatic tubes that sends all laws into a reception box – and then you wait. Now a team of translators - lawyers, judges and writers - is activated, and out comes a legislative proposal written in official legal language – or a poem. Law Shifters is a new exhibition created by Danish artist Stine Marie Jacobsen who has been working since 2016 on her international art project with this title. It is a project that both enters into a dialogue with and challenges the existing laws, and thus puts the citizens’ right to a direct democracy on the agenda. With Law Shifters Stine Marie Jacobsen creates a new way of relating to society. Do children, young people, adults and the elderly take different views on ethical problems? How do children relate to current legislation concerning, e.g., refugees or privacy? ”With Law Shifters we wish to present a serious, but also humorous and creative way of relating to existing regulations and legislation in Europe. The world is changing, so how do the new generations perceive laws and rights that in some cases are based on decades or centuries old ideas and structures?”, says Andreas Brøgger, head of Nikolaj Kunsthal. From November 2017 to May 2018, Denmark holds the chairmanship of the Committee of Ministers of the Council of Europe. The chairmanship is celebrated with a Danish cultural programme in Strasbourg. Law Shifters is the main manifestation in Denmark during the chairmanship. The new law texts that will come into being during Law Shifters at Nikolaj Kunsthal will subsequently be exhibited in the main building of the Council of Europe in Strasbourg.